Ford is building the new Focus in Germany for European markets. The car will include driver aids such as parking- and lane-assistance software. FRANKFURT (Bloomberg) -- Ford Motor Co. expects to sell enough Focus compact cars in Europe to reach full capacity next year at a German factory making the new version of the model, helping the automaker stem a decline in market share in the region. Output of the Focus, which went into production on Monday at a plant in Saarlouis, will probably reach the daily maximum of 1,850 cars by the end of January, said Bernhard Mattes, who runs Ford's German factories. The Saarlouis plant will be the single source for new Focus production in western Europe, producing all three body styles -- a four-door, five-door and station wagon. The car will go on sale as early as March in Germany and be available in other major European markets by the second quarter, Mattes said. 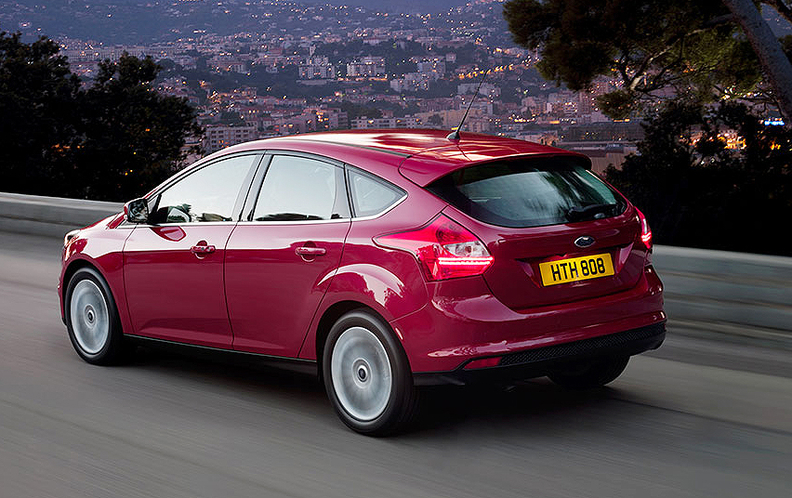 The third-generation Focus will include driver aids such as parking- and lane-assistance software. Ten-month sales of the current Focus, Ford's second-best-selling model in the region after the Fiesta, slid 14 percent to 220,400 in 19 European countries. Ford said Nov. 15 it expects 2010 European sales industrywide to slump to as little as 14 million vehicles. The new Focus, which shares about 80 percent of its parts globally, will be offered in 120 markets worldwide. The car will start at $16,995 in the United States., Ford said in October. A price for Europe hasn't been set yet, Mattes said. The company has invested 300 million euros ($399 million) in manufacturing equipment at Saarlouis and has offered 500 permanent jobs to temporary workers to build the Focus. Production for the U.S. market has already started at a factory in Wayne, Michigan. A plant in St. Petersburg will serve the Russian market starting in mid-2011 and factories in Chongqing, China, and Rayong, Thailand, will make the Focus for Asia starting in 2012. More than 10 million Focus cars have been sold around the world since its introduction in 1998. The Saarlouis plant built almost 3.7 million of the 6 million examples sold in Europe. The Saarlouis plant employs 6,500 workers who build cars on three shifts. The factory currently produces the Focus and Kuga medium SUV.